All our roof lanterns shown on this website are designed to be fixed onto a kerb-like detail which rises proud of the supporting flat roof assembly, precisely at the open edge of the lantern aperture. This kerb is called an upstand, the outside face of which allows the flat roofs external surfacing to lap up and form a weather-tight junction. An upstand ensures that the waterproofing does its job and that building elements are not flooded or saturated. Upstands also help protect against rainwater bouncing up off the finished roof surface. 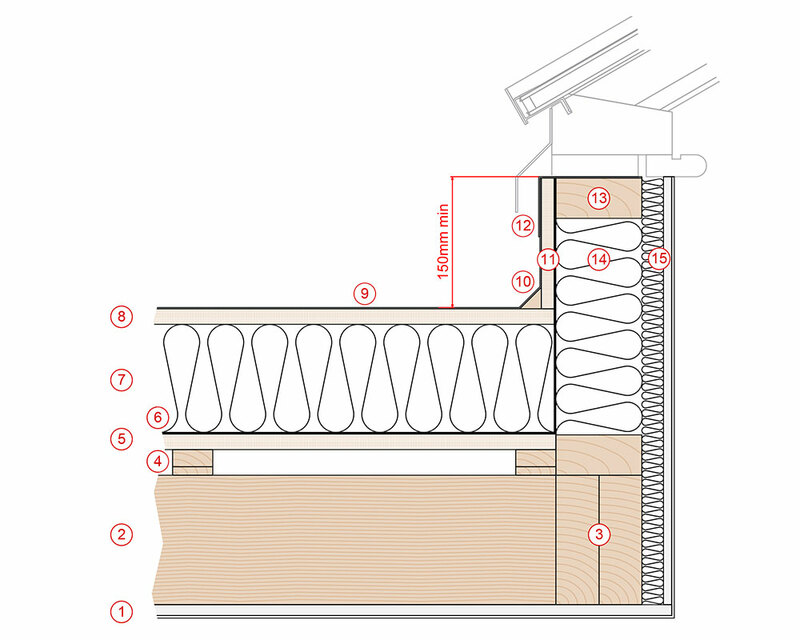 The accompanying drawing shows a typical section through an upstand at the aperture within a flat roof. Always ensure actual build meets with all current regulations / good building practice. Typical Section through Flat Roof. 1. 12.5mm plasterboard with skim finish. 2. Timber roof joists. The spacing and sizes of joists is related to the loadings and span. Actual dimensions can be taken direct from recommendations in Approved Document A. Strutting between joists should be used if the span exceeds 2.4m to restrict joist movement and twisting. 3. 2 No. joist trimmers. The size of trimmers will vary depending on their span. Steel channels or I-beams will be required on very large projects. Always consult a structural engineer. 4. Firring pieces of diminishing depth to create fall to the roof weathering surface. 5. 18mm exterior grade ply or OSB Board (BS EN300 types 3 and 4). 6. Vapour control layer fitted between joists and insulation. 7. 125mm (min) Polyurethane insulation (such as Celotex or Kingspan). 8. 18mm exterior grade ply or OSB Board (BS EN300 types 3 and 4). Requirement depends upon chosen external weathering finish as some waterproof membranes can be bonded directly to the insulation. 9. External weathering finish to individual preference. 11. 15mm exterior grade ply. 12. Code 5 lead flashing. 13. 100mm wide upstand frame constructed from 100mm x 50mm timber. 15. Insulated plasterboard with skim finish.